One of the key skills for volleyball players to master is to serve the ball with a top spin so that it will drop down more quickly than the receiver of the serve might expect. This is possible because a spinning ball will follow a curved trajectory when a non-spinning ball will not. The reason for the swerve can be understood by looking at the air flowing past the ball. 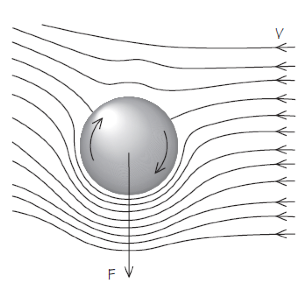 When the air flow impinges on the ball the flow lines are pushed together, so the pressure drops and the speed of the air passing the surface of the ball increases. Air flow around a spinning ball. If the ball is spinning then the flow lines of the air near the surface of the ball are significantly altered. In the picture on the left you can see what happens if the ball has been given a clock-wise spin in addition to its straight line motion at speed V from left to right. The non spinning motion is just as if the ball were stationary with air going past its surface at speed V. What is the effect of the spin? At the top of the surface of the spinning ball the air speed very close to the surface of the ball is in the opposite direction to the on-coming air whereas at the bottom it is in the same direction. This means that the net speed of the air near the top of the ball is less than that round the bottom. So the pressure on the ball is greater at the top than the bottom and there is a net downward force, F. The orientation of the picture shows how a ball served to the right with top-spin will always swerve downwards. This will reduce the time that it spends in the air and give the receiver less time to respond and return the ball. You can read more about the effect of spin on the trajectory of a ball in our article Spinning the perfect serve. Copyright © 2010. University of Cambridge. All rights reserved.